The first half of the eighth season of the Walking Dead aired on Sunday night. One of the biggest shockers since the beginning of the show, this midseason finale delivered a cruel gutpunch amid tons of action and development. Like a few of the previous episodes, the action here is split up amongst different groups. Maggie and the Hilltop survivors, Rick, Carl and the Alexandrians, Enid and Aaron going to Oceanside and of course, Negan. 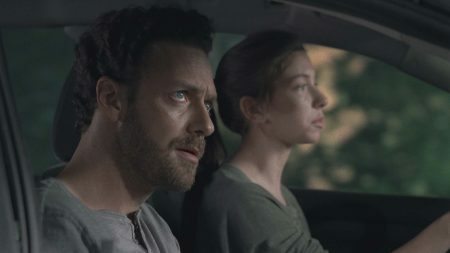 Enid (Katelyn Nacon) and Aaron (Ross Marquand) are on a mission to connect witrh the crazies at Oceanside. They are discovered, and Enid shoots the old woman. That is all we see here. At the Sanctuary, Eugene (Josh McDermott) decides to help Gabriel (Seth Gilliam) and the doctor escape. At the beginning of the show, Ezekial (Khary Payton) is seen scrambling out of sight as the saviors come to the Kingdom. 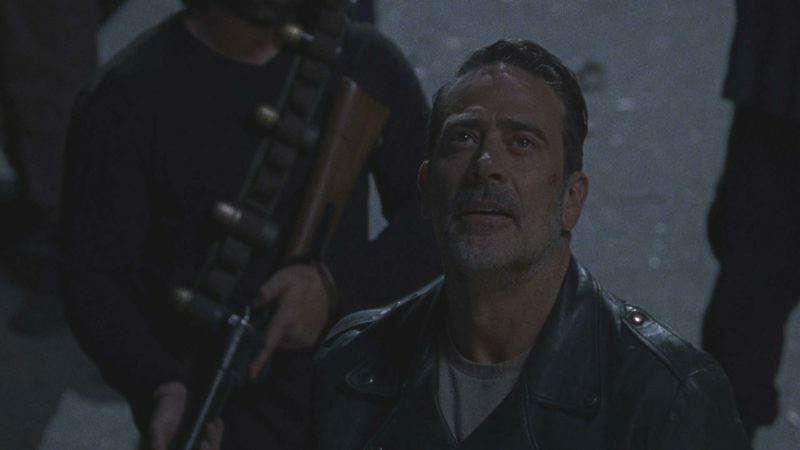 During their visit, Negan’s (Jeffrey Dean Morgan) men explain to the citizens of the Kingdom that they will be moved to the Sanctuary to repair the damage. There is a lot of threatening rhetoric thrown around before the Saviors finally ask the residents to give up Ezekial. Of course, none of the residents give up, knowing that Ezekiel has a plan. Right as things are going down hill, Ezekial triggers a chain reaction to free his residents. He cannot escape, though, and the last we see of Ezekial is him surrendering to the Saviors. Maggie (Lauren Cohen) is in a caravan with Jesus (Tom Payne) and a bunch of other Hilltop residents. Things take a left turn, though, when the Saviors block the road. Simon (Steven Ogg) appears and gives Maggie the rundown. Either way things go, the Hilltop residents will continue to serve the Saviors. The difference will be Maggie’s death, however. She agrees to drop the fight and return to work, but Simon shoots one of her people anyway. Upon returning to the Hilltop, Maggie kills one of the prisoners as an example. Rick (Andrew Lincoln) realizes that Negan and the Saviors have escaped. He begins to make a beeline towards Alexandria. Back at the base of operations, Negan and the Saviors have announced and are causing a ruckus. They want Rick. Carl (Chandler Riggs) decides to kick his plan into action. Trucks blast through the wall to escape the zone as Carl is distracting Negan. This doesn’t last long, however, and tha Saviors begin firebombing the zone. Dwight (Austin Amelio) guns down a number of Saviors, and is found out by another high ranking Savior. She shoots him, but he escapes with the rest of the Rick group after some tense discussion. The group descends into the sewers like the battletoads they are. Meanwhile, Micchone (Danai Gurira) is melting down in the burning Alexandria Safe Zone. Rick arives and has a brutal fight with Negan in his home. Rick and Micchone escape to the sewer where everyone else is waiting. Down in the sewers, we find that Carl has been bitten. The episode cuts out. There isn’t much more to say. This blew me away. Carl is supposed to be safe. This is going to really throw the entire rest of the series into whack.